Since 2001, I have built four companies, starting each with a few hundred dollars. My first sold for $107 million, and I had similar success selling my second in 2011. I know what it takes to achieve professional, financial, and personal goals. I have no identifiable skill or talent. I come from a poor background with as many hang-ups as anyone else. I had no family or business connections to help me. I have, however, studied the attributes, talents, and insights of sell-made men and women. From their successes, I formed three rules and have lived them consistently for 20 years. They have turned an ordinary life into extraordinary. 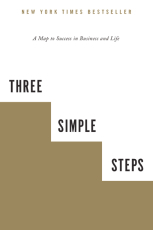 I'm not a sell-help guru, but a pragmatic businessman whose only advantage in life has been the application of these three simple steps. I didn't write this to make money. All my profits from this book go to cancer research. I wrote it because it works. In recent years, I have taught these steps to individuals and groups and have seen the impact they can make in all avenues of life. Using these three steps, anyone from the road warrior to the stay-at-home parent can achieve a better, balanced, financially independent life.